Prior to the introduction of Parksmart certification, there was no third-party sustainability certification available to our clients for their new and existing parking garage projects. Not only were our new design clients looking for a sustainability certification alternative, but clients with existing parking garages also wanted a certification that recognized the efforts they had made toward sustainability. Parksmart certification provided the solution for both types of clients. As an approved Parksmart Advisor, DESMAN is trained to lead clients through the certification process for sustainable parking structures. While DESMAN is currently assisting many clients through the Parksmart certification process, two of our university clients were the first to express an interest in and submit to become certified under the Parksmart rating system. 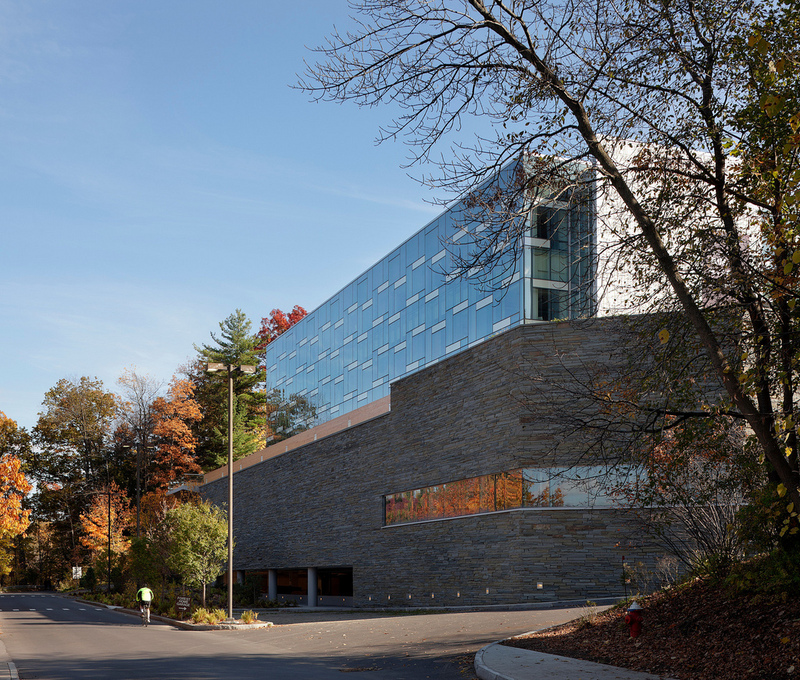 The Cornell University and Salem State University projects are just two examples of how Parksmart certification has enabled DESMAN to help its clients meet their goals. Cornell University is committed to cutting net carbon emissions to zero by 2035, in addition to improving sustainability campuswide. Parksmart provided the university a guide to improving the physical characteristics of their two garages (Forest Home and Hoy Field), as well as their operation, as a means of moving the parking system in the direction of sustainability. Since becoming the first university to have a garage certified by Parksmart, Cornell has also earned the International Parking Institute’s Accredited Parking Organization status, furthering its commitment to operating in an environmentally responsible manner. Forest Home garage at Cornell University. At Salem State University, the Massachusetts State College Building Authority (MSCBA) was looking for funding sources for a new parking garage on campus. One of the options identified were “green bonds,” or bonds created to fund projects that have positive environmental or climate benefits. Typically, for a project to qualify for this type of financing, the project must receive some type of independent sustainability certification. In the case of the Salem State parking garage, the only option available was Parksmart certification. Based on a commitment to obtain this certification, MSCBA was able to secure the funds necessary to construct the garage, which opened in November 2015. From a business perspective, being a Parksmart Advisor has enhanced the range of expertise that I can provide to DESMAN’s clients. Both the Parksmart Advisor Training and my experience guiding clients through the certification process have expanded my knowledge of sustainable management and programmatic and parking technology/design areas, which I have been able to apply to subsequent planning and consulting assignments.